Our quality mild snack sticks are naturally hickory smoked and laced with spices to offer a unique, lightly spicy and full flavored snack stick combined with smooth and creamy Wisconsin cheddar cheese. Our quality Colby Jack n Stick Combo offer a unique, lightly spicy and full flavored snack stick combined with Colby Jack Cheese, a blend of Colby and Monterey Jack cheeses into one stick. Our quality Pepper Jack n Stick Combo offer a unique, lightly spicy and full flavored snack stick combined with Pepper Jack cheese, a blend of Monterey Jack Cheese and jalapeno spicy peppers. Our quality String n Stick Combo offer a unique, lightly spicy and full flavored snack stick combined with String Cheese, mild in flavor. 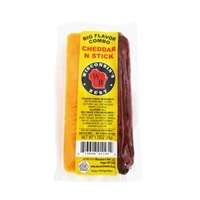 Our quality Mild Snack Sticks are naturally hickory smoked and laced with our spices to offer a unique, lightly spicy and full flavored snack stick combined with Smooth and Creamy Wisconsin Cheese made with our Nationally known Wisconsin Cheese Company quality. Our quality Mild Snack Sticks are naturally hickory smoked and laced with our spices to offer a unique, lightly spicy and full flavored snack stick combined with Colby Jack Cheese, a blend of Colby and Monterey Jack cheeses into one stick. Our quality Mild Snack Sticks are naturally hickory smoked and laced with our spices to offer a unique, lightly spicy and full flavored snack stick combined with Pepper Jack cheese, a blend of Monterey Jack Cheese and jalapeno spicy peppers. Our quality Mild Snack Sticks are naturally hickory smoked and laced with our spices to offer a unique, lightly spicy and full flavored snack stick combined with String Cheese, mild in flavor.